The USDAC-NYC Field Office and Five Boro Story Project invite you to imagine a liberated society that has put an end to police violence and where Black lives truly matter. Through a story circle, community mapping, and “love note” writing, we’ll share our stories and ideas, and imagine the ideal future we are fighting for – the first step towards making it reality. This Imagining aims to affirm and strengthen local community by inviting participants to express love for the neighborhood in a collaboratively composed “South Bronx Love Letter.” Participants will unleash their creativity as they work collectively to envision a society that upholds human dignity towards restorative justice. This program is part of BronxArtSpace’s show “Speak Out,” an exhibition in response to the continued failure of the US to protect its Black citizens from police discrimination and violence. BronxArtSpace is located at 305 E 140th Street. Take the 6 train to 3rd Ave/138th Street, exit at Alexander Avenue, walk two blocks north to 140th Street, and turn left. 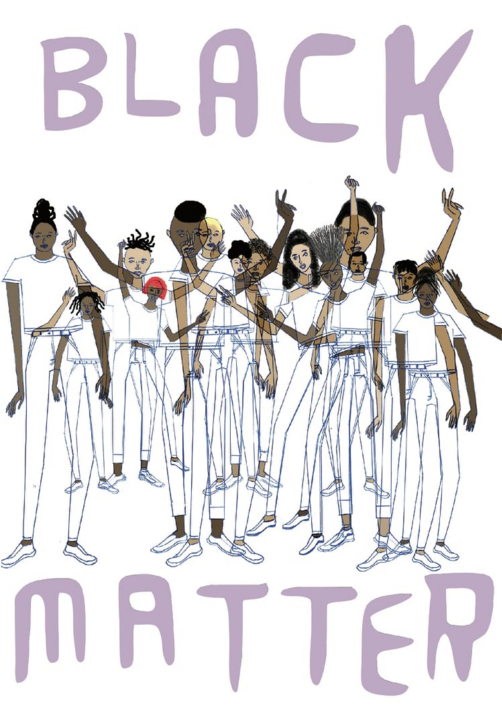 Rafael Melendez, Black Lives Matter, 2016.